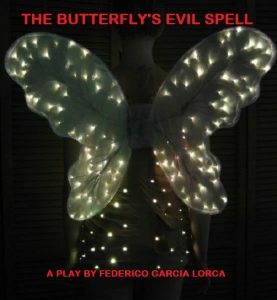 Set in a little patch of garden, The Butterfly’s Evil Spell is an imaginative comedy about insects in distinctly human situations. A beetle poet falls in love with a butterfly and his love goes unrequited. Through his poetry, Garcia Lorca weaves a poetic story of love and loss with tragedy and comedy laced together through out the play. Utilizing both live actors and large mechanical puppets, this production is a visual treat for an audience of all ages. An original score by Jake Heath lends a punk sound as does the lighting and costumes. Come for a unique, one – of – a -kind theatre event.